So, how do you train a chipmunk? They may poop on you sometimes. Be very aware of that, as it will happen often. Chipmunks will nibble your fingers if you are new to them. Your fingers might resemble peanuts! Don't overreact if they nibble you a bit. Just pull away gently and, if they are already used to you, give them a tap on the nose as if to say, "No." They won't like, that, it will teach them a lesson! If it appears that, the chipmunk has rabies or any sort of disease, DO NOT FEED IT. If a chipmunk bites you and pierces the skin, go to a hospital immediately! They could have any disease! Don't have any cats or dogs around while you're feeding them. Other animals will scare them off. Locate the chipmunk. Watch around your backyard or front yard to see if he have some particular spot: it could be a stump, or a large stone, a pile of bricks. If you don't even have any chipmunks in the area, then you won't have much luck training. If you regularly feed the birds, you probably already saw chipmunks near the feeders, stealing bird’s seeds. Once you know where the chipmunk like to stay, leave some nuts around that area and keep an eye on him. 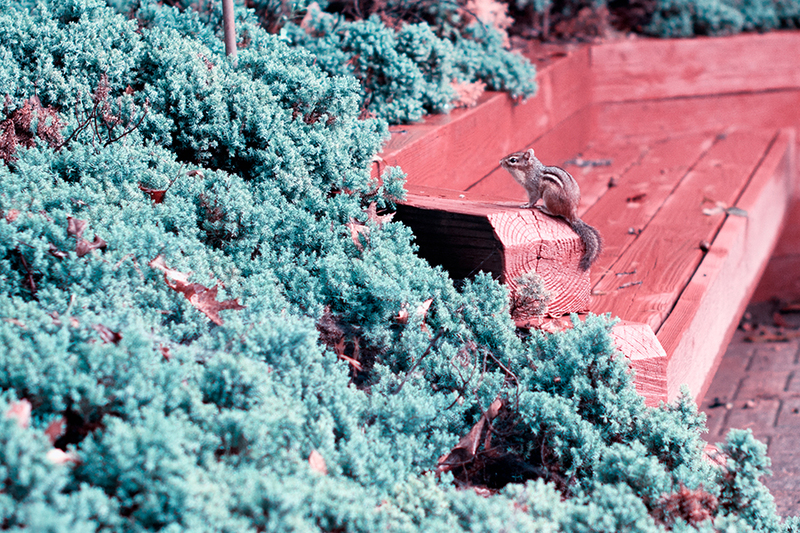 Chipmunk might smell your scent on the peanut, but if he is hungry, he won't resist taking it! Replace with more peanuts, and keep this up until the animal have become accustomed to finding peanuts there, and come back to the spot looking for more. After a while, you might catch a glimpse of one. Leave a small trail of peanuts leading to where you are. Don't get too close at first; start far enough away so as not to frighten him, then move a little nearer, gradually getting closer as he gets accustomed to your presence. Finally, you will be able to sit right beside the chipmunk. Don't move while you're watching one. Movement always startles chipmunks. Make soft clicking noises with your tongue, to draw him in or comfort. After the chipmunk has become used to your being there, start putting your hand on a place where you usually feed chipmunk. When he gets used to that, keep the peanuts in your hand instead of putting them near. How long it will take him to overcome his normal timidity and take a peanut from your hand depends on the individual chipmunk — and your patience and ability to hold still. But when he does, you'll find joy in every feeding. Other way is to hold a peanut between your fingers. The peanut should be sticking out more towards the chipmunk, so that he don't bite your finger instead! I had accidents in a past when my little chipmunk tried to pull off my finger, assuming that it’s a peanut. )) No bites, just desire to steal my finger! Whatever you do, don't move! If the chipmunk is skittish, it could come really close and run away. Don't get frustrated! He will come back. But this time make every move as smooth as possible. Soon after, they will be all over your body, doing tricks! Start bringing your hand, with the peanuts in it, nearer to your lap, a little at a time, between his trips. Eventually you will have him feeding from your hand next to your lap. Then move your hand partly up over to your lap, so that he has to reach for peanuts. Next, bring the hand entirely on the lap, but so he can still see it and know where to go. Then move, a little at a time, between trips, so that soon he is coming entirely on to your lap to get the peanuts from your hand. Keep this up until he is entirely accustomed to using you as his feeding table. HAVE FUN with your new pets! Have cleaning materials around. Chipmunks poop! Try to clean up after them, or you will have a sea of peanut shells in your backyard!